Last week I attended my very first Global Mission Summer Missionary Conference (SMC). It is the time when global personnel from all over the world are on their bi-annual home assignment stay. That means that every year half of the global personnel that are sent by the ELCA out into the world to accompany Lutheran Churches and other institutions are gathered. The SMC which takes place at Carthage College in Kenosha, Wisconsin offers fellowship, formation and fun. There were about one hundred and twenty-eight people in attendance which includes most of the Global Mission staff that work at the Lutheran Center in Chicago. 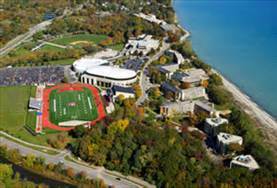 Carthage is a beautiful setting; it is right on Lake Michigan. It provides an opportunity to sit on the beach, watch the moon rise and have pleasant walks in the morning. During the conference there is time for worship and reflections. In the college chapel, worship with preaching and eucharist begins the conference and a remembrance of baptism and anointing ends the SMC. Every other day of the SMC devotions are offered as we gather for plenary. There is also a chance to hear engaging Lutheran Theologians. This year Rev. Dr. Carmelo Santos and Rev. Dr. Barbara Rossing talked to us about origin and destination narratives. 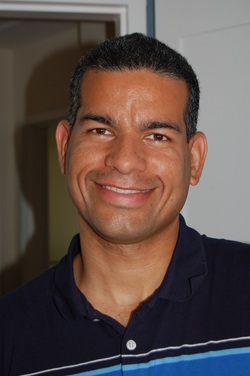 Dr. Santos told us that as a person from Puerto Rico his history included Africans, Indians and Europeans. As he showed us a statue that represented this history, he said that parts of his origin narrative, part of his story is one of violence and oppression. This is the part that no one sees or makes explicit. Thus portions of his history, part of his origin narrative is unspoken. So the popular story that we hear of the beautiful people on the island of Puerto Rico is an invented story. Because of this Dr. Santos let us know that stories of origin are invented and his origin narrative is broken. He also assured us that being invented does not mean these stories are not true, but if invented these stories can be re-invented. He also told us that a broken narrative can be mended. The other meaningful part of SMC is simply being with old friends and meeting new people. I welcomed a new long-term missionary that is going to Sierra Leone, Rev. Morsal Collier. I got to hang out with Rev. Dr. James Thomas a professor from Southern Lutheran Theological Seminary. He is going on sabbatical; Dr. Thomas will be teaching for a semester at Good News Theological College and Seminary in Ghana. 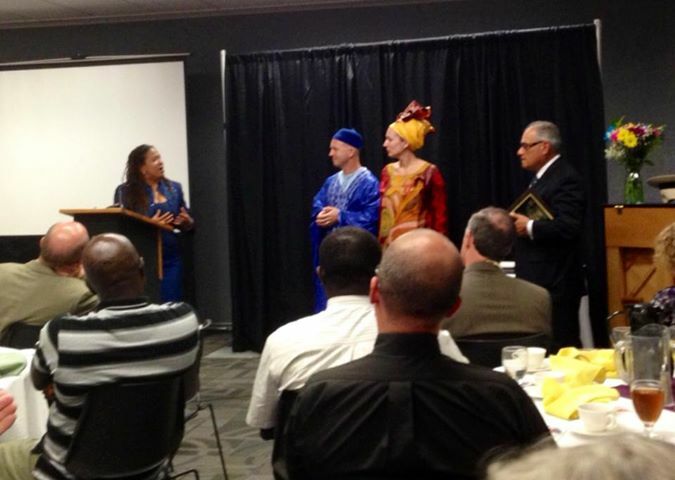 Other members of the West Africa team, Joe and Deb Troester who serve in the Central African Republic were also there. Part of the job of Area Program Directors is to meet with global personnel for consultations and debriefing. During this time I had the pleasure of having conversations with global personnel serving in West Africa that I have never met: Mary Beth and Bayo Oyebade and Sarah and Dirk Stadtlander. The Oyebades serve in Nigeria at Mashiah Foundation and the Stadtlanders have completed service in Linguere Senegal. At every SMC there is recognition and celebration at a formal banquet. This year there was recognition of Mashiah Foundation and the supporters of that ministry the Upper River Iowa Conference of the Northeastern Iowa Synod. Also, there was recognition of long-term global personnel completing service through videos and certificates. Although just getting to know the Stadtlanders, I was able to thank them for their service and tell the gathered community of their deep and abiding love for the people, the culture and country of Senegal. It was an intense but good week. I look forward to many SMCs and getting to meet wonderful people who serve all over the world. Some of the work that is supported by ELCA Global Mission is the translation of the Bible into local languages. This can sometimes be long, hard, painstaking work. A son and brother of former ELCA global personnel has been working as a translation consultant since 1992. It can also be exhilarating work. I had the privilege of meeting a professor, in Linguere, Senegal who was working on the translation of the bible into Pulaar. It was exciting to sit with him and hear him speak about the nuances of biblical languages and the struggle to capture those nuances in a native African dialect. He felt that his work was exciting work. 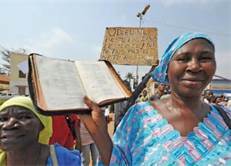 This violence also resulted in the looting and destruction of the Bible Society in Bangui which is where the copies of the newly translated Bible were stored. Many of us who had been hoping and praying for the release and dedication were disheartened. The Bibles were delivered in February; since then, members of the Bible Society and all interested parties have been collectively holding their breath. A line in a string of e-mails I received dated in April read: ” The office of the Bible Society was spared looting. Around the office, all the villas have been looted. 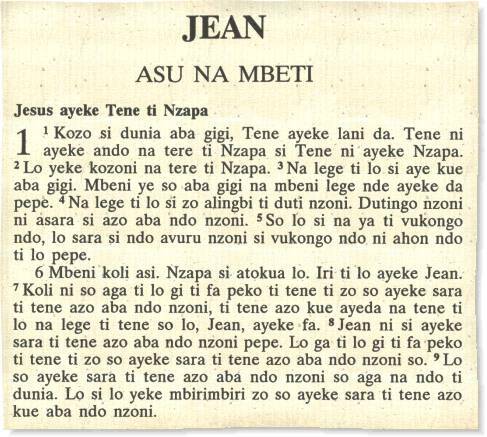 For example, this morning full day (8:30 to local) Seleka rebels raided private villa not far from the office of the Bible Society. . .” In June, this time, the Bible Society was not spared. There was destruction, damage, theft of office equipment and vehicles. Money was stolen. Yet, the Bibles at first thought to be destroyed, remained intact. On Sunday, June 30, the dedication of the Sango Common Language Bible took place and everyone in attendance went home with copy. 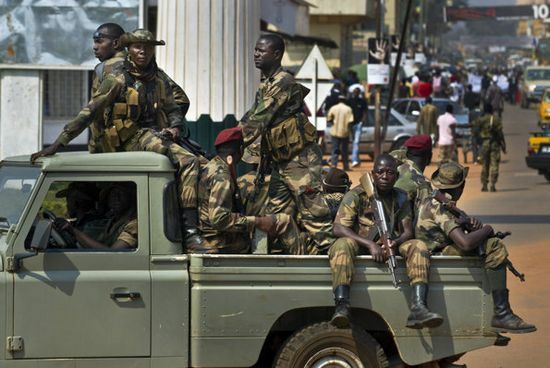 Who knows when the situation in Central African Republic will be stable and secure. I wrote in my very first blog on this site, I am disappointed that we do not hear more about such tragedies in our news. What I ask is if you read this blog: take a moment, say a prayer for the people of the Central African Republic, for peace in the entire world and pray that the word of God will somehow bring comfort to those who now have the ability to read it in their native language.